Most Israelis would have surely answered: Of course. After all, only two years earlier, Israel had offered to withdraw from virtually the entire West Bank and Gaza. In return, it received the worst wave of terrorism in its history. That Israeli narrative of why the peace process failed transformed Israel’s politics for a generation, leading to the near-total collapse of the left as a viable political force. Meanwhile, much of the world ignored Israel’s spurned overture and continued to fault the Jewish state for the continuing occupation it had sought to end. Today, we Israelis are experiencing another moment of radical disconnect with much of world opinion. Every Friday for the past several weeks, the Islamist Hamas has mobilized tens of thousands of demonstrators, who have embarked on a “march of return” toward Israel. 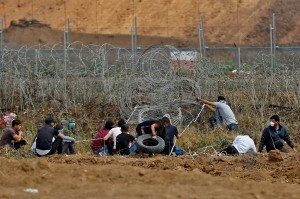 The initial goal is to destroy the fence and cross Israel’s internationally recognized border. The long-term goal is to demographically destroy the Jewish-majority state through a “return” of descendants of Palestinian refugees from the 1948 war. In response, Israel has used live fire against the demonstrators, killing dozens and injuring over a thousand in the last month of protests. Israel has been fiercely condemned by United Nations officials, European leaders and human rights organizations, who insist that the Israel Defense Forces is, once again, resorting to disproportionate force. But for Israelis, the weekly demonstrations — which are accompanied by firebombs and burning kites dispatched into Israeli fields and breakthroughs by small groups of Hamas members into Israeli territory — are an intolerable threat. While the world sees images that confirm the Jewish state as the region’s Goliath, many of us regard our country as Goliath and David simultaneously. In our conflict with the Palestinians, we are the overwhelming power. But in our conflict with much of the Arab and Muslim worlds, we are vulnerable. Israel has in the past been the underdog. And if we lessen our alertness, we could be again. The presence of terrorist enclaves on almost every one of Israel’s borders helps explain the determination of the I.D.F. to prevent demonstrators from trying to break through the fence. But that resolute posture creates another strategic threat for Israel. The very tactics that keep us relatively safe in one of the world’s most dangerous regions are undermining our moral credibility abroad. This, then, is Israel’s dilemma: Can it maintain its deterrence in the Middle East without fatally undermining its position in the West? One of the lowest moments in the Israeli disconnect with world opinion occurred in 2010, when the Turkish ship, Mavi Marmara, tried to break the Israeli sea blockade of Gaza. Israeli commandos boarded the ship and in the ensuing skirmish, 10 Islamist activists were killed and several dozen wounded, along with 10 wounded Israeli soldiers. Israel argued that enforcing its sea blockade was essential in preventing Iranian missiles from reaching Hamas. Moreover, insisted Israel, its soldiers were in mortal danger from armed passengers. But the international consensus against Israel was devastating: Israel had killed supposedly peaceful humanitarian aid workers, and its blockade against Gaza was a war crime. A year later, the United Nations released the surprising results of its inquiry into the incident. While it faulted Israel for excessive force, it acknowledged that soldiers faced organized violence. Most surprising of all, the investigation supported both Israel’s right to board the ship and to impose the blockade as acts of self-defense consistent with international law — the first time in memory that the United Nations had upheld an Israeli position. Yet today those findings are almost entirely forgotten, and Israel once again stands accused of maintaining an immoral blockade of Gaza. The moral dissonance between Israel and the international community only strengthens the Israeli hard right, which argues, in the words of an old Israeli song, that “the whole world is against us.” Disproportionate criticism — for example, the fact that Israel is criticized in United Nations forums more often than all the other countries in the world combined — reinforces that isolationist mind-set. When critics trivialize a threat to Israel’s border as “peaceful demonstrations,” Israelis conclude that world opinion is either obtuse or hostile. The result is a dismissal of any criticism. By contrast, when Israelis sense a willingness in the international community to consider their concerns, they tend to respond with greater openness to the moral critiques of outsiders. The Oslo peace process was born in part because of the changed atmosphere toward Israel in the early 1990s, when the collapse of the Soviet Union, which had led the diplomatic campaign against Israel, resulted in numerous countries establishing relations with the Jewish state. Palestinian Soccer Match – a precursor to World Cup?